Bob Hoskins (born "Robert William Hoskins) was a famous English actor, best known for his film roles in Who Framed Roger Rabbit? and Hook, but most of all for playing Cockneys and gangsters. He also worked to renowned the BT adverts. "Five-foot-six-cubic" is how Bob Hoskins described his dense, brick-like physique, and in his career as one of Britain's most familiar and reliable screen actors Hoskins was compared to all sorts of non-human entities. A bulldog. A fireplug. A face like "a damaged potato," in the words of critic Pauline Kael. It has been reported that Bob Hoskins had never considered acting until somebody approached him in a pub and suggested that he go upstairs to audition for a play. He landed the role and went on to launch a stage career on the London in the late 1960s. Bob Hoskins fist came to the attention of the general public when he was cast in a TV version of Pennies From Heaven by Dennis Potter. He then starred in On The Move, a TV series designed to address adult illiteracy. In Jonathan Miller's BBC production of Othello, Hoskins was cast as Iago. In the 1970s, Bob Hoskins continued to feature in a number of TV series, such as New Scotland Yard and Thick as Thieves. In the 1980s, Hoskins starred in a number of films that brought him to the attention of a broader fan-base and won him a great deal of critical acclaim. In 1980, he starred in The Long Good Friday, with Helen Mirren. Two years later, he appeared as the Rock and Roll Manager in Pink Floyd's The Wall, as directed by Alan Parker. In 1985, Bob Hoskins played a comic role in Terry Gilliam's off-the-wall film Brazil. The film also starred Michael Palin and Robert de Niro. In 1986, he appeared in Mona Lisa. His performance opposite Cathy Tyson won him a Cannes Award, as well as an Oscar nomination and a Golden Globe Award. Toward the end of the 1980s, he starred in two international hits: the first was Who Framed Roger Rabbit?, a mix of animation and film noir, which starred Kathleen Turner, Christopher Lloyd and Joanna Cassidy, while the second was Mermaids, in which Hoskins starred alongside Cher and Winona Ryder. Hoskins' next big hit came with 1991's Hook. Hook was primarily a children's film that also appealed to a wider audience and was based on the Peter Pan story character of Captain Hook. Robin Williams played the lead character in the film, which also starred Julia Roberts and Dustin Hoffman. In 1993, when Bob Hoskins was cast in the Super Mario Bros. film, he was unaware that it was based on a computer game. Hoskins has since commented that it was the worst film that he has ever worked on. It has been reported that Bob Hoskins was second in the running to play Al Capone in The Untouchables (a role played by Robert De Niro). The film's director, Brian De Palma, still sent Hoskins a £20,000 cheque and a 'Thank You' note, despite not having a part in the film. The 1990s were another lucrative period for Bob Hoskins. In 1995, he played J. Edgar Hoover opposite Anthony Hopkins in the title role for Nixon, one of Oliver Stone's respected historical biopics. Hoskins was also cast in HBO's popular TV series Tales From The Crypt. A number of high profile stars appeared in the series, including Daniel Craig, Eddie Izzard and Brad Pitt. In 1997, Hoskins had a guest cameo appearance in Spice World, the Spice Girls movie that also featured Richard E. Grant, Elton John and Jennifer Saunders. From the late 1990s into the following decade, Hoskins' career continued to gain credibility. He starred in Shane Meadow's A Room For Romeo Brass, along with Paddy Considine and Vicky McClure, as well as a role in Enemy at the Gates, with Jude Law and Joseph Fiennes. Following roles in Last Orders, Maid in Manhattan and Vanity Fair, Hoskins landed a role in Mrs Henderson Presents, which would earn him a Golden Globe nomination for Best Actor. The film also starred Dame Judi Dench. On 29 April 2014, Hoskins died from pneumonia. He is survived by his wife Linda and his four children. With his first wife Jane Livesey, Hoskins had two children, Alex (born 1969) and Sarah (born 1972). With his second wife Linda Banwell, he had two more children, Rosa (born c. 1984) and Jack (born c. 1986). 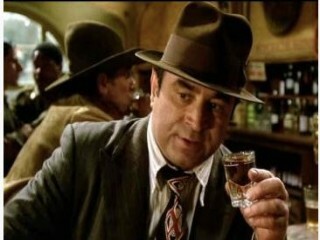 View the full website biography of Bob Hoskins.